Storefront signs feature animations derived from still photos and text. Casio is at CES 2013 looking to change the face of storefront signs by announcing storefront signs with... changing faces. This futuristic-looking digital signage features animated characters or people who attempt to talk to passer-bys via computer-generated voices. "As you can see, Casio Signage provides realistic images that captures customers' attention better than other approaches," said Casio Senior General Manager of Signage Department, Toshiharu Okimuro. The Casio signage system is compact, measuring just 18 inches by 21.1 inches. Its base looks like a cash register, only one with a customized flat animated character cut-out on top of it. Casio demonstrated a grocer introducing his fresh produce, a male model hawking his apparel, and a chef talking up his Italian cuisine. 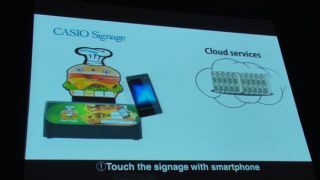 By far, the most interesting Casio digital signage demo was a talking hamburger that was cutesying up its fast food menu. This talented burger could speak in a variety of languages including English, Chinese, Korean, and Spanish. In addition to an animated hamburger character, Casio's experience with light source projection helps store owners connect with customers. A bright Laser and LED hyprid light source is built into these signs. Casio promises that this new digital signage product, which costs US$10,000 and launches at the end of January, will last 20,000 hours. Best of all for retailers is what this Casio's digital signage doesn't come with. There's no installation work and no video production required. Casio does all of the work with just a still image and text.